Firewood can be expensive to purchase, so it's good to understand the standard sizes to ensure you are getting what you are paying for. Buying firewood by the truck load has too many variables to be able to determine the size you are getting. The most common measurement used for firewood is the cord. A full cord of wood is measured 1.2 m (4') x 1.2 m (4') x 2.4 m (8'). A face cord or stove cord is 400 mm (16") x 1.2 m (4') x 2.4 m (8'). The most common piece of firewood length is 400 mm (16"). Cut, split and stack firewood in the warmer months so that the sun and airflow can allow for adequate drying. Stacking the wood with a barrier at least 6" from the ground height will prevent moisture from the ground Wood should be left to dry for at least 1 year before use. Firewood should have a moisture content of less than 20% before being burned. Ideally, wood should be below 12% moisture content for a clean burn. ​Burning wet wood, or large pieces will result in a smoldering fire that will produce dangerous creosote deposits in your wood-burning appliance. 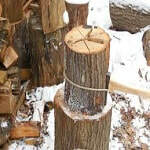 Splitting firewood by hand can be very labour intensive, yet rewarding. 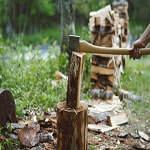 To do so, you will need a a good pair of working gloves, chopping block (large round log piece), a splitting axe or maul and lots of energy. 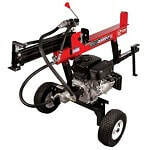 Alternatively, a manual or hydrolic log splitters can be purchased or rented. First cut the wood to 16" length. Place the round log to be split on the chopping block. Wrapping a bungee cord or rope around the round will help keep the wood together and makes for easier stacking. Strike the log near the outer edge or in any visible splits or cracks. Pieces should be split to a thickness of 4" or less will allow for faster drying times and cleaner burning. 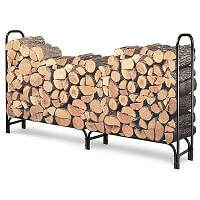 There are many different ways to stack firewood, but the basis is for storage and to let it dry. Stacking 16" lengths that are split to a similar thickness will allow for neat and easy stacking. 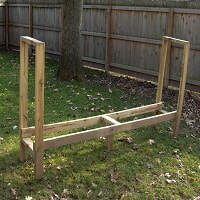 It is recommended that your firewood rack be constructed so that it is elevated at least 6" from the ground. 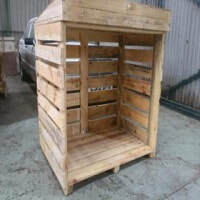 This will allow for air flow, and prevent moisture from the ground seeping up into the wood. Placing a tarp on top of a rack may be an option to keep rain and snow out, but it may also trap moisture in, preventing the wood from "breathing". The following tree species can be found and used for firewood in Western Canada. Below is a list of tree species listed in order from densest to softest. Technically, tree species that shed their leaves are considered hardwoods (except larch), and conifers are softwoods. The most important aspect of burning any type of wood is to ensure that it is dry. For example, it is a far better choice to burn dry well seasoned Trembling Aspen rather than wet larch. The hardest to softest hierarchy below signifies the wood density and million BTU's per cord. Before lighting a fire, it's important to have your wood burning appliance inspected by your local certified chimney sweep service provider. Your chimney sweep can evaluate your fireplace or wood stove and chimney for compliance, sweep the chimney if necessary, and demonstrate how to use it properly. Balsam Fir's are often used as Christmas trees, so look for a Christmas tree, and likely it will be a spruce or fir. You can distinguish a Blasam Fir by trying to roll the needles in your hand. If the needles are flat, you have a Balsam. Black Spruce is a wet area species, so it is often found around swamps, ponds or bodies of water. The needles are about a half inch long, blunt tipped, stiff, often with fine red hairs present on twig. Jack Pine needles come in clusters of two and are straight to slightly twisted. Lodgepole Pine can be identified by observing the 2 pine needles per cluster that are predominantly twisted. The bark on a lodgepole pine is characteristically straight like a pole, has an orangy red tinge in the brown bark, and often has it's leaf clusters further up (no branches low to the ground). The Western Larch conifer needles turn yellow in the fall, and fall off before winter. Needles are soft, flat, and straight approxemately 1" long and come in clusters of 10. Aspen Poplar is pervassive in Alberta forests. The tree can be identified by how the leaves tremble in the wind. The leaf is ovate to oval, sharp pointed tip, leaf stem slender and flatened. Leaf is ovate, dull green textured surface, serrated margin, purple red to white thin bark. White spruce also resembles a Christmas tree. Unlike Balsam Fir, the needles are squared. The needles are 1" long, sharp, pointed, and have a strong odor when crushed. Now that you have learned how to identify tree species, gather your firewood and stack it, it's time to learn how to burn wood properly. Check out the Canadian Chimney How to Burn Wood web-page. Natural Resources Canada issued a bulletin on grades of firewood that introduces grades of firewood, the important parameters that affect the fuel characteristics, and appropriate use.